Am pretty well out of painting crit these days (life moves on except in this stodgy realm) but people keep posting links to NYC's equivalent of the medieval stonecutter's guild and its bible of sacred words. 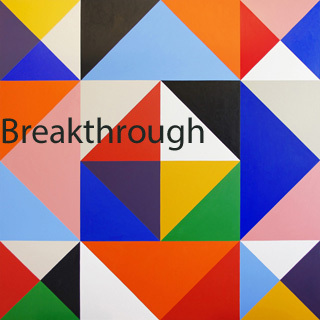 One of these is "breakthrough" and John Yau abuses hell out of it in this Hyperallergic review (or Hyperallergenic, as Salon once mistyped it). Stephen Westfall has been making and exhibiting crisp, polished geometric-style paintings for three decades now. He bounces back and forth between iconic centralized images that could almost be corporate logos and more "allover" patterns where the eye is kept moving around a field. His most recent show contained both types, as likely will his next one, and the one after that. So it's spurious and ahistorical for Yau to take one of the "field" ones in a single show and pronounce it a breakthrough, with full late Greenberg orotundity. If Westfall had a creative breakthrough it was when he went from whatever he was doing to the styles of paintings he's doing now, which was probably the mid-'80s. Another kind of breakthrough would be if he left this groove and started doing something performative, or with computers. Or smartphone art. Give it a rest, John Yau. 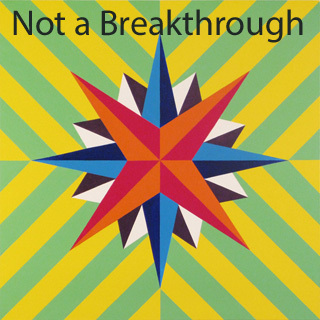 Please don't ever write that "breakthrough" review again.